How do I file a complaint against an insurance company or banking institution? How do I report consumer fraud in New Jersey such as billing disputes, unsatisfactory service, failure to deliver goods, Internet sales disputes, check or credit card scams, telemarketing or warranty program fraud? How do I report welfare fraud? How do I report Medicaid recipient fraud? What types of disability fraud does OIFP investigate? Does OIFP investigate unemployment insurance fraud? What types of workers’ compensation fraud does OIFP investigate? Does OIFP investigate uninsured motorists? Does OIFP investigate tax fraud? Does OIFP investigate Section 8 (federal housing subsidies) fraud? Does OIFP investigate Medicare fraud? Can I submit my name, but yet remain anonymous? How can I follow-up on a complaint if I submit it anonymously? Does OIFP investigate cases when a vehicle is kept at a New Jersey location with license plates issued from another state? Contact the New Jersey Department of Banking and Insurance (NJDOBI) for complaints against insurance carriers and discount health plan providers, complaints involving mortgage, banking and real estate issues, and for questions about insurance coverage. Link to the NJDOBI Web site or call them at 800-446-7467(Insurance Claims Ombudsman) or 609-292-5316 (Consumer Assistance - Insurance). 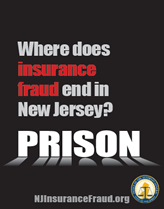 Contact the New Jersey Division of Consumer Affairs at www.NJConsumerAffairs.gov or call them at 800-242-5846. Contact your local police department and/or the Federal Trade Commission (FTC) for more information. Link to the FTC Identity Theft Web siteor call them at 877-IDTHEFT(877-438-4338). Contact the New Jersey Department of Human Services (NJDHS) for the County Board of Social Services where the subject resides. For a list of New Jersey County Boards of Social Services, visit the NJDHS Web site or call the Division of Family Development (NJDFD) at 800-792-9773. Contact the Office of State Comptroller, Medicaid Fraud Division. Link to their Web site or call them at 888-937-2835. OIFP investigates Private Plan disability fraud. The New Jersey Department of Labor & Workforce Development, Division of Temporary Disability Insurance investigates fraud against the State’s temporary disability fund. The Social Security Administration, Office of Inspector General investigates fraud involving permanent disability awards paid by Social Security. Link to the New Jersey Department of Labor and Workforce Development, Division of Temporary Disability Insurance Web site or call them at 609-984-2285. Link to the Social Security Administration, Office of Inspector General or call them at 800-269-0271. No. You should contact the New Jersey Department of Labor & Workforce Development, Unemployment Fraud Hotline at 609 777-4304 or visit their Web site. OIFP does not generally investigate motorists who drive without the required automobile insurance. You should contact the New Jersey Motor Vehicle Commission (NJMVC) and the local police. Link to the NJMVC Web site or call them at 888-486-3339 or 609-292-6500. Information about a motorist who possesses a forged or falsified motor vehicle insurance identification card should generally be reported to the local police. No. You should contact the Internal Revenue Service (IRS) at 800-829-0433 for federal tax matters or the New Jersey Department of Treasury, Division of Taxation at 609-292-6400 for state tax matters. Link to the IRS Web site and link to the New Jersey Department of Treasury. No. You should contact the U.S. Department of Housing and Urban Development (HUD) at 800-347-3735. Link to the HUD Web site. No. Medicare is a federally funded program. You should contact the Department of Health and Human Services, Office of Inspector General at 800-447-8477. Link to the Department of Health and Human Services. Yes, you can still remain anonymous if you provide your name. The caller will get a complaint number at the end of the call and he/she can call back with that number to get a case status. No. You should contact the police department in the municipality where the vehicle is kept.